The Museum has received "possibly its greatest honor of all time," according to curator Lou Brooks, when it was recently acknowledged by none other than Zippy the Pinhead himself! 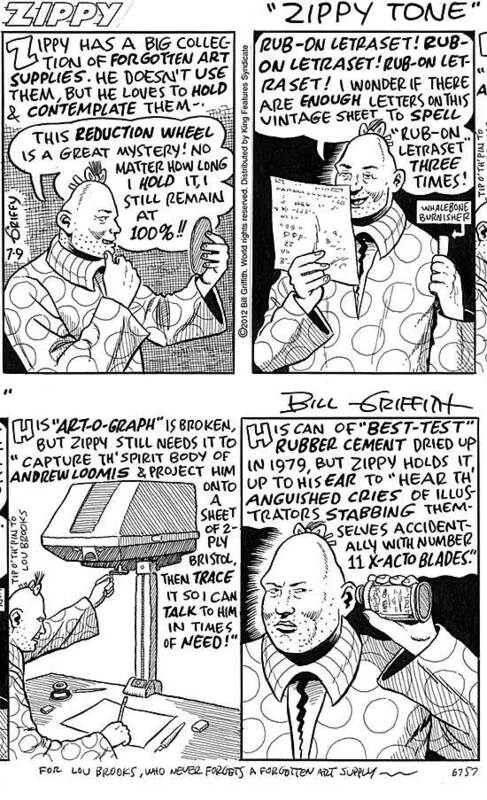 Today's July 9 Zippy daily comic strip treats readers to a quick tour of Zippy's very own collection of forgotten art supplies, along with a "tip o' th' pin to Lou Brooks" (see panel 3) by strip creator Bill Griffith. "I'm speechless. Zippy is exactly the type of person the Museum's trying to reach. His is the perfect forgotten art supply attitude," says Brooks. The original art is now part of Brooks' personal comic art collection. Griffith began the actual strip in The Berkeley Barb in 1976, and it was soon syndicated nationally as a weekly strip. Today, Zippy is distributed worldwide to more than 100 newspapers by King Features Syndicate.